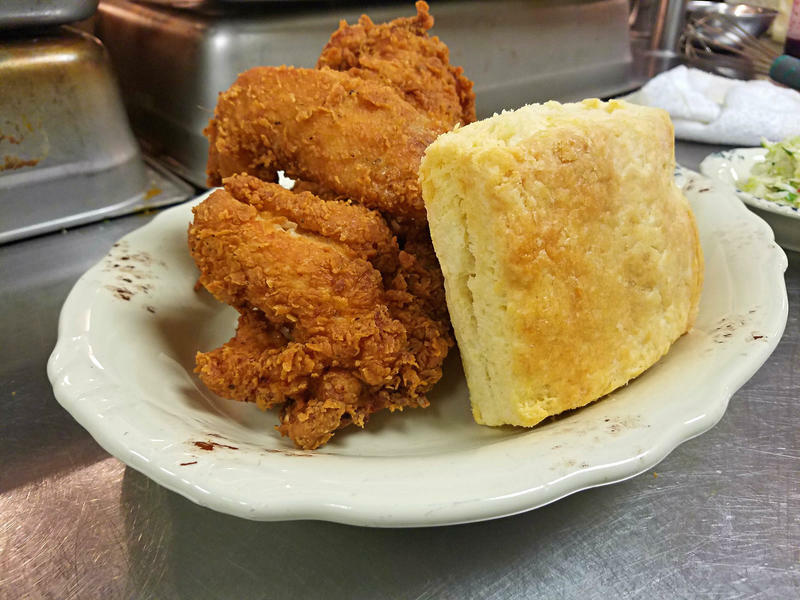 The "Sir Mix a lot" at Whistle Britches includes three pieces of golden fried chicken with a side of potato salad and a homemade biscuit. Fried chicken is king in Texas. But it doesn't just taste great — making the perfect fried chicken is an intricate science. And to get at that science, we got the help of three key players from the North Texas chicken scene, who broke down the physics of the fry. There's Omar Flores, a formally trained chef and James Beard Award finalist who's dabbled in molecular gastronomy. His new chicken joint, Whistle Britches, is in Far North Dallas. There's Sandra Bussey, chef and co-owner of bbbop Seoul Kitchen in Oak Cliff, where Korean fried chicken is making its mark. Then there's Kenji Lopez-Alt, our science guy, who helped break down fried chicken into its basic elements. He's the managing culinary director of Serious Eats and the author of "The Food Lab." Everyone agrees brining is important. The process involves soaking raw meat in a salt water solution overnight. Brining can mean the difference between a dry, flavorless chicken or a supremely moist, piquant bird. The brine at Whistle Britches, for example, mimics the flavor of a dill pickle. "A lot of fresh dill, a lot of fresh coriander, dill seed, there's mustard seed in there. We do garlic, rosemary, kind of real savory herbs," Omar Flores said. "I think it penetrates the chicken, and when you finally fry it, you end up with a juicier, more aromatic product." Flores' brine is an complex cocktail, but a classic brine can be as simple as salt and water, as long as the ratio is four tablespoons of salt per four cups of water. "The salt will break down a protein called myosin," said science guy Lopez-Alt. "If you look at a piece of chicken, or any meat really, under a microscope, it resembles a bunch of cables that are strung together and bound together. And each one of those cables contains juices." The heat from frying forces those protein cables to squeeze out moisture. "When you brine something, all it does is it breaks down some of the muscles so that when you’re cooking, it doesn't squeeze on those bundles, so a lot more of those juices end up staying inside rather than squeezing out," he said. In the Whistle Britches kitchen, Chef Omar Flores dunks his chicken pieces into buttermilk and thickly coats them with seasoned flour. "And before it goes into the fryer, one real important thing is, I call it the 'clap,'" Flores said. "You take your pieces of chicken, and you clap them together." Chef Omar Flores of Whistle Britches is a James Beard Award semifinalist and also owns Casa Rubia in Trinity Groves. This process is called dredging and battering, and it's what gives fried chicken that crispy outer shell. And while the batter is critical for texture and flavor, Lopez-Alt said it has an even more important purpose. "We dredge because we want to create an insulating layer between the food and the oil. Oil is very hot, as it gets hotter and hotter, muscle proteins contract and they squeeze out moisture and your chicken can end up really dry," he said. "The brunt of that energy is being used to brown that batter, drive off moisture from the batter, and what actually gets in the chicken travels much more slowly." The Whistle Britches batter is starkly different from the batter at bbbop Seoul Kitchen, where they keep it thin with just a milky mix of flour and water. Chef and co-owner Sandra Bussey said that light coating is what gives Korean fried chicken its signature crunch. What makes Korean fried chicken stand out is what’s known as the "twice-fry." "The first time around, you’re actually cooking the chicken through," Bussey said. "The second time around is just to get that crust, and it’s only about a two-to-three-minute burn." 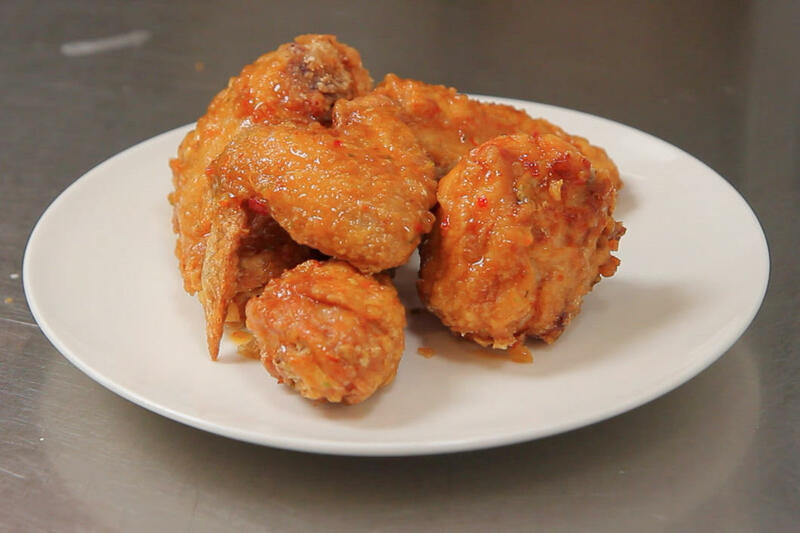 Korean fried chicken hinges on three unique characteristics: a thin batter, the twice-fry and a light glaze. "It's very, very crispy. I mean if you’re looking for crispy chicken, you should try the Korean fried version because it's got an almost crackled glass texture to it," Bussey said. The first fry evaporates most of the moisture, which allows the batter to crisp more easily. The first fry actually changes the microscopic anatomy of the batter. 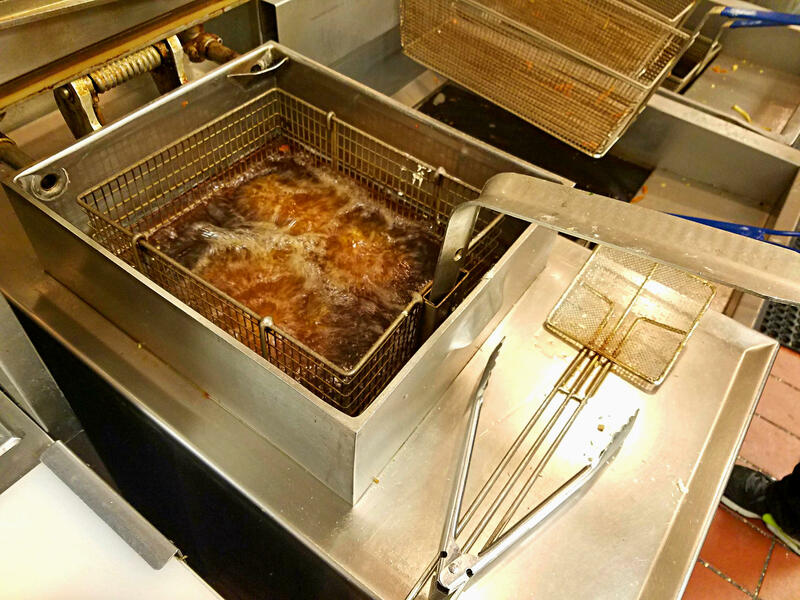 The hot oil straightens out air pockets that make it easier for water to escape, making it a drier, crisper fry. The secret weapon at Whistle Britches is the pressure fryer, which looks like a large steel pot with what Chef Omar Flores calls a "submarine lid." He puts chicken pieces inside and seals it tightly shut, and that's where thermodynamics comes into play. For 10 minutes, the moisture coming off the chicken while it cooks collects above the oil and causes the pressure to build up inside the fryer. That pressure raises the boiling point of the oil, which allows the chicken to cook faster without losing the essential moisture. Whether you twice fry like or fry in a pressure cooker, the science once the chicken hits the oil is pretty much the same. 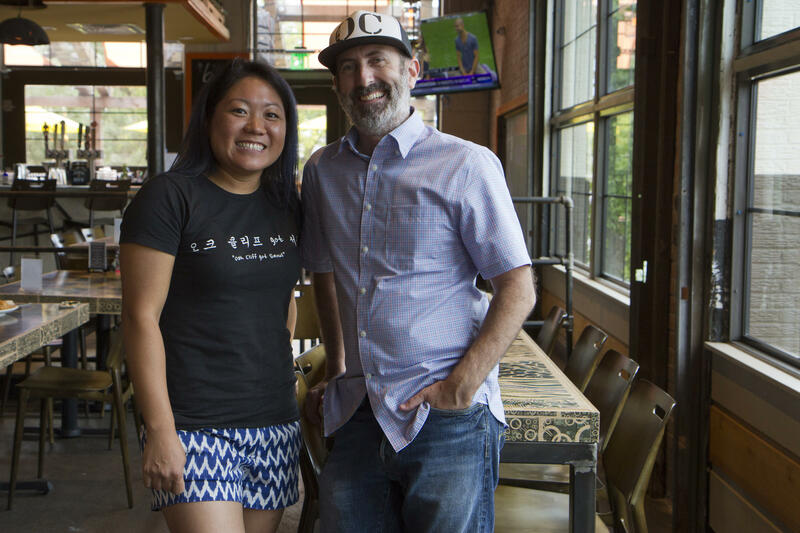 Sandra and Greg Bussey are chefs and co-owners of bbbop Seoul Kitchen. Their Korean fried chicken is only available at the Oak Cliff location. "When you're deep frying, the main process that's going on is dehydration," Lopez-Alt said. "You're driving off water content, and that's what’s going to allow your food to stay crispy once it gets crisp." If dehydrating the chicken is so essential, how does it stay juicy? Lopez-Alt said water has very little to do with it. "[Juiciness] is a sensation that's perceived on our tongue but really fabricated in our brain. It's a combination of water content and also fat content. A fatty steak tastes juicy because there's fat melting in our mouths," he said. "And when something is more appetizing, it triggers our brain to tell our salivary glands to produce more saliva, and that also makes things taste juicy to us." 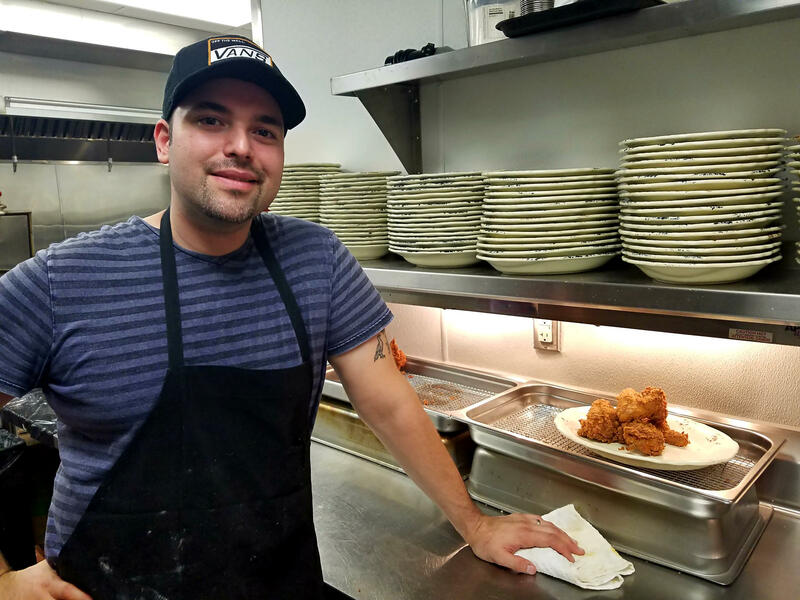 At Whistle Britches, Omar Flores uses both a fryolator and a pressure fryer for his fried chicken -- though he prefers a cast-iron skillet when frying at home. There are a couple of other scientific processes happening simultaneously during the fry. There's expansion. The heat from the fryer causes air bubbles in the batter to stretch — the same way a ball of dough puffs up in the oven. The expansion thins out the batter and gives it that crunch. Then comes something called protein coagulation, which is just scientific jargon for the batter turning solid. All the while, through oil absorption, oil seeps into the empty pockets in the chicken where water was cooked off, giving the chicken juice and flavor. The real magic comes when the browning and caramelization kick in, as part of a chemical process known as the Maillard reaction. "Essentially what you're doing is breaking up the larger protein chains into smaller pieces," Lopez-Alt said. "Those smaller pieces are then reacting with each other, forming larger proteins again, breaking down again, and what you end up with is hundreds of chemical compounds that weren't present at the food in the beginning." The Final Step: Eat The Delicious Fried Chicken! The Maillard reaction is what produces that char on a grilled steak or the golden brown crunch of fried chicken. Lopez-Alt said those flavors and sensations all get at something fundamental. "We have evolved to crave fat, salt and starch because these are all concentrated calorie sources," he said. "It's basically just hitting all the primal pleasure centers of our brain." Whether you're at Whistle Britches or bbbop Seoul Kitchen or the countless other chicken joints across North Texas, the science is constant. The recipes are chemistry, physics and thermodynamics. But our love for fried chicken is basic biology.